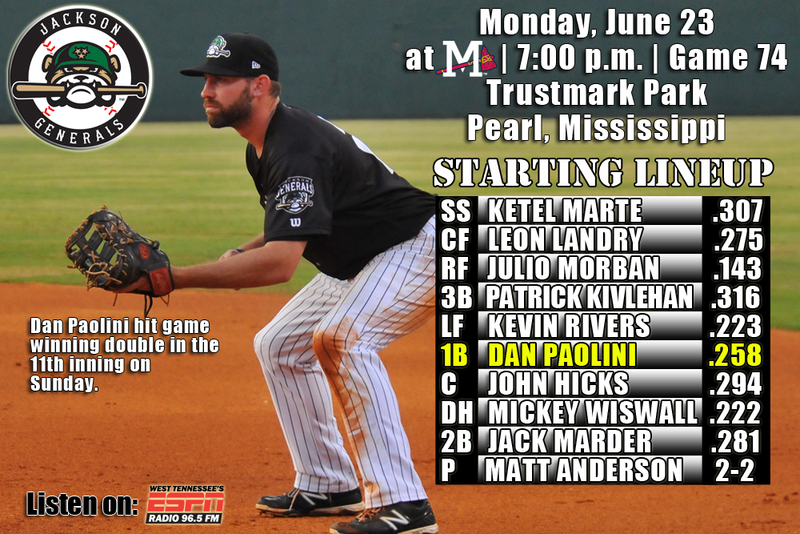 • Tonight the Generals continue the 10-game homestand (1-5) with game two of a five-game series against Mobile (0-1). The Generals went 1-4 against Tennessee in the first leg of the homestand…are 3-8 against Mobile this season. • RF Julio Morban (0x3, RBI, SF) and 1B Patrick Kivlehan recorded back-to-back RBI to give the Generals a 2-0 in the first inning, but the pitching staff couldn’t hold the lead as Jackson fell to Mobile 4-3 on Sunday. • SS Ketel Marte (2×4, 2 R, 2 3B, BB) led the team with 2 hits, while Kivlehan (1×3, 2B, 2 RBI, BB), CF Leon Landry (1×5), 3B D.J. Peterson (1×3, R, BB), LF Daniel Paolini (1×4) and Dario Pizzano (1×3, RBI) each recorded 1 of the Generals 7 hits. • Starter Tyler Olson (7.0,6,3,3,1,5) allowed 3 runs on 6 hits in7.0 innings, but did not factor into the decision. LH Kyle Hunter (0.2,2,1,1,0,1) recorded his 2nd loss of the season after allowing a run in the top of the 8th inning, while RH Stephen Shackleford (1.1,0,0,0,0,3) struck out 3 of the 4 batters faced to close out the game. • OF Julio Morban has hit safely in 6 of his last 7 games, batting .407 (11×27) with 3 runs scored, 2 doubles, 1 RBI, 1 triple and 1 walk. • OF Leon Landry has hit safely in 16 of his last 18 games with 10 multi-hit efforts, batting .397 (27×68) with 11 runs scored, 4 doubles, 2 triples, 4 RBI, 3 walks and 8 stolen bases. • Jackson is 12-13 in June with a .296 AVG which ranks 2nd in the league and six Generals are batting over .300 this month. • Jackson’s last 2 starting pitchers, Matt Anderson (Sat) and Tyler Olson (Sun) combined for 14.0 IP, allowing 4 runs, 3 earned (1.93 ERA) on 11 hits with 10 strikeouts and only 1 walk. 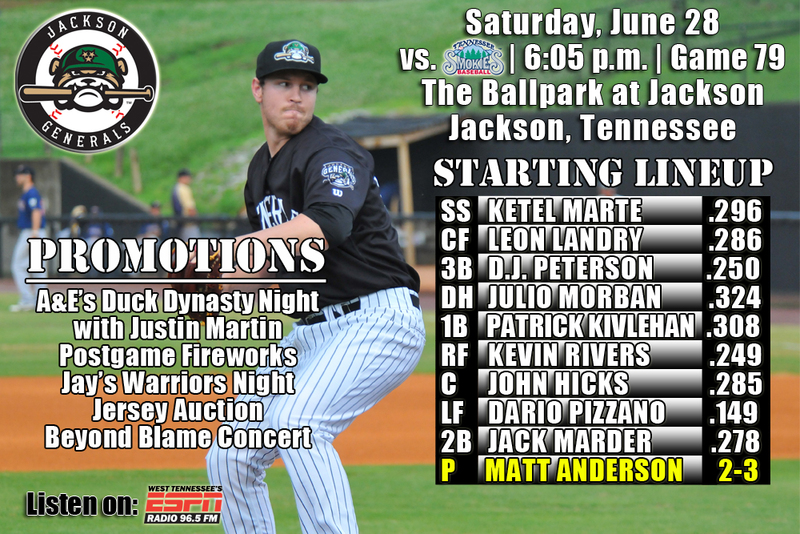 • Tonight the Generals continue a 10-game homestand with game the series finale against Tennessee (0-4). 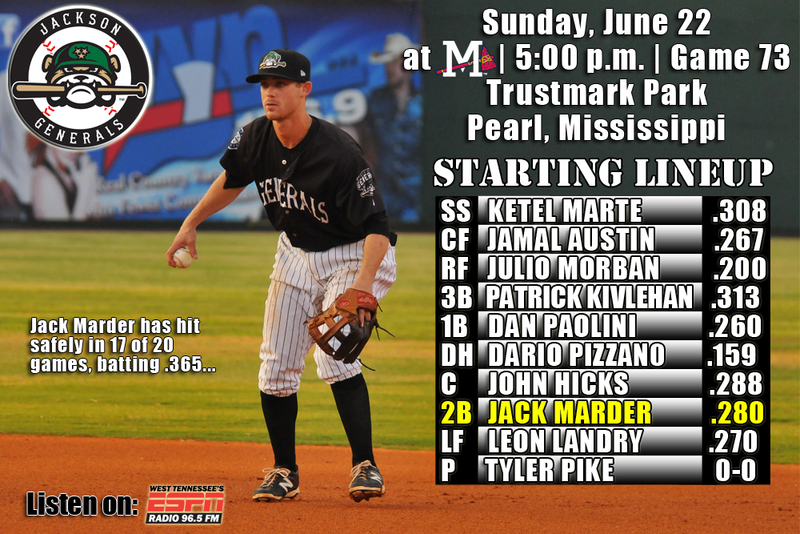 The Generals welcome Mobile on Sunday for a five-game set. The Generals are 4-9 against the Smokies this season including 1-7 at The Ballpark at Jackson…were 2-3 on recent road trip to Mississippi. • The Generals scored 5 runs combined in the 3rd and 4th innings, but allowed 4 runs in the top of the 8th inning as Jackson fell to Tennessee 6-5 on Friday night. • CF Leon Landry (3×5, R, 2B, RBI) and DH Kevin Rivers (3×4, R) each recorded a team-high 3 hits, while RF Julio Morban (2×4) picked up the only other multi-hit game for the Generals. Rivers hit his 3rd home run with Jackson with a solo homer to lead off the 3rd inning. • Starter Tyler Pike (2.0,2,2,2,5,1) allowed 2 runs on 2 hits in 2.0 innings, but did not factor into the decision. RH Forrest Snow (4.0,2,0,0,0,5) struck out 5 in 4.0 scorless innings and RH Stephen Shackleford (1.0,0,0,0,0,1) struck out 1 in a 1-2-3 9th inning. RH David Colvin (1.2,3,3,3,0,2) and RH Mayckol Guaipe combined to allow 4 runs in the 8th inning. Guaipe recorded his 2nd loss of the season. • OF Leon Landry has hit safely in 14 of his last 16 games with 10 multi-hit efforts, batting .424 (25×59) with 11 runs scored, 4 doubles, 2 triples, 4 RBI, 3 walks and 7 stolen bases. • OF Kevin Rivers currently has a 7 games hit steak, batting .440 (11×25) with 3 runs scored, 4 doubles, 1 home run, 3 RBI and 1 walk. • OF Julio Morban his hit safely in his last 5 consecutive games, batting .450 (9×20) with 3 runs scored, 2 doubles and 1 walk. • Jackson is 11-12 in June with a .298 AVG which ranks 2nd in the league and seven Generals are batting over .300 this month. • D.J. Peterson, the No. 2 prospect for the Mariners, according to Baseball America and was Seattle’s 12th overall selection in the 2013 draft out of New Mexico. He made his Double-A debut on Thursday going 1-for-3 with a double and walk. • Peterson, in 65 games with the Mavericks hit .326 (89×273) with 51 runs scrored, 23 doubles, 1 triple, 18 home runs, 73 RBI, 23 walks and 6 stolen bases. At the time of his promotion, he ranked among the California League leaders in nearly every offensive category, including slugging percentage (1st/.615), total bases (1st/168), RBI (1st/71), extra-base hits (T1st/42), home runs (2nd/18), doubles (3rd/23), hits (T5th/89) and average (6th/.326). 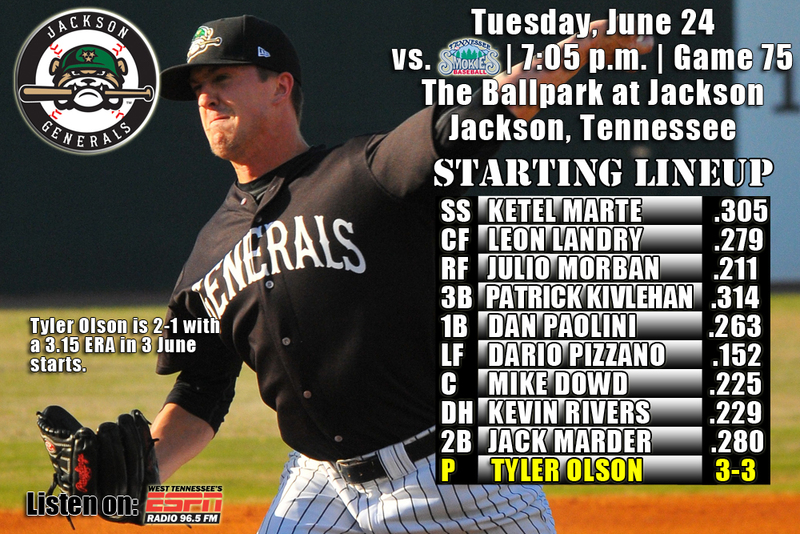 • Tonight the Generals continue a 10-game homestand with game four of a five-game series with Tennessee (0-3). 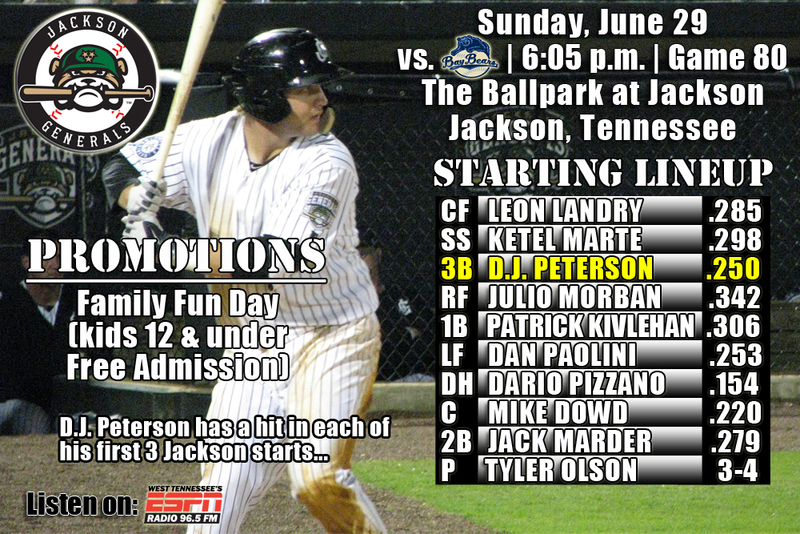 The Generals welcome Mobile on Sunday for a five-game set. The Generals are 4-8 against the Smokies this season including 1-6 at The Ballpark at Jackson…were 2-3 on recent road trip to Mississippi. 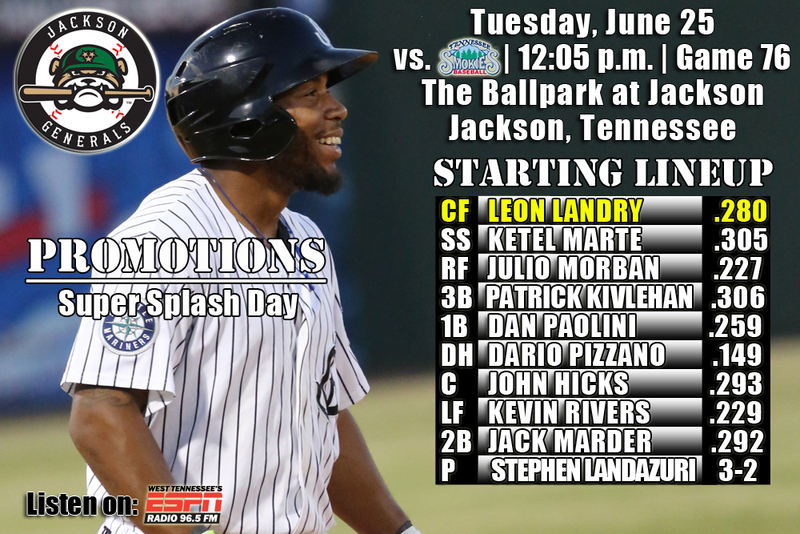 • DH Kevin Rivers (2×3, 2 2B, BB) doubled twice and joined RF Julio Morban (2×4) and CF Leon Landry (2×4) with two of Jackson’s 9 hits on Thursday, but Jackson was shutout for the 7th time this season to Tennessee 4-0. The Generals dropped the series and lost their fourth straight. • Starter Victor Sanchez (4.0,8,4,4,1,2) allowed 4 runs on 6 hits in the 3rd inning and suffered his second straight loss. Relievers Trevor Miller (3.2,2,0,0,0,3) and Richard Vargas (1.1,1,0,0,0,0) combined for 5.0 innings scoreless behind Sanchez. • 3B D.J. Peterson made his Double-A debut and went 1-for-3 with a walk and double on Thursday night. • 3B Patrick Kivlehan has hit safely in 19 of his last 20 games, batting .421 (32×76) with 13 runs scored, 9 doubles, 1 triple, 2 home run, 20 RBI, 7 walks and 1 stolen base. • SS Ketel Marte has hit safely in 24 of his last 27 games, batting .303 (33×109) with 16 runs scored, 5 doubles, 1 triple, 18 RBI, 2 walks and 4 stolen bases. • Jackson is 11-11 in June with a .296 AVG which ranks 2nd in the league and seven Generals are batting over .300 this month. • The current Jackson roster features seven of Seattle’s Top-30 prospects, according to Baseball America. 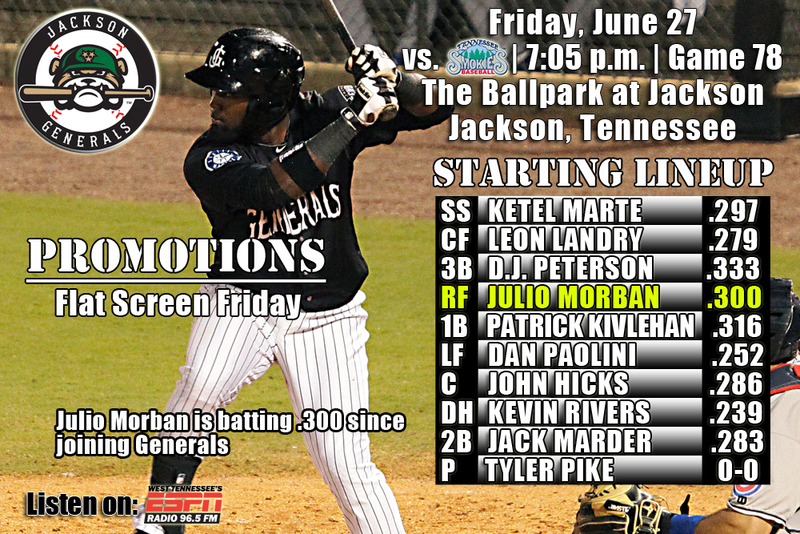 • Tonight the Generals continue the 10-game homestand vs. Tennessee and Mobile. This will be game two of a five-game series against Tennessee. The Generals are 4-6 against the Smokies this including 1-4 at The Ballpark at Jackson…were 2-3 on recent road trip to Mississippi. • Jack Marder (3×3, R, 2B) recorded his third 3-hit game of the season Tuesday night, but Jackson fell in the opener of the series against Tennessee 6-2 in an 8 inning rain shortened game. • There was 1:43 in delay and Tennessee scored 3 runs in the first two innings on Tuesday. • CF Leon Landry (1×3, RBI, BB) drove in a run in the 3rd and SS Ketel Marte (1×4, RBI) in the 7th inning, but it wasn’t enough. • Starter Tyler Olson (6.0,8,6,3,0,6) suffered his 2nd straight loss on the mound. RH David Colvin (1.1,0,0,0,0,2) worked the final 1.1 and 1 out in the 8th before rain stopped the game. • On Top of the League in June – The Generals are currently leading the league in batting in June at .302 and are T-2nd in the league with an 11-9 record. This is after posting the first 20-loss month since June, 2007 by going 9-20 during the month of May. • Bus lag strikes again – After Tuesday’s 6-2 loss the Generals are now 2-8 when coming off a bus ride. • Home Sweet Home – OF Jamal Austin has a 15-game home hitting streak batting .339 with 14 runs, 2 doubles, 1 triple and 1 RBI. It’s tied for the longest home hitting streak in the league this season…C John Hicks has a 10-game home hitting streak batting .429 with 8 runs, 4 doubles, 1 triple and 6 RBI. • SS Ketel Marte currently has an 11-game hit streak, batting .341 (14×41) with 7 runs scored, 8 RBI, 1 walk and 2 stolen bases. It his his 5th hitting streak this season of at least 7 games (last: 13 G, 5/25-6/7). He has also hit safely in 24 of his last 25 games, batting .324 (33×102) with 16 runs scored, 5 doubles, 1 triple, 18 RBI, 2 walks and 4 stolen base. • INF Jack Marder currently has a 7-game hit streak, batting .480 (12×25) with 4 runs scored, 1 double, 1 home run and 3 RBI. Since May 24, Marder has hit safely in 20 of 23 games with 10 multi-hit efforts, batting .381 (32×84) with 16 runs scored, 4 doubles, 2 triples, 3 home runs, 12 RBI and 5 walks. • C John Hicks is batting .352 (31×88) with 16 runs scored, 7 doubles, 1 triple, 2 home runs, 12 RBI, 8 walks and 4 stolen bases in 23 games. During this stretch, since May 11, he has raised his season average from .224 to .293. • Since May 22, RH Matt Anderson is 2-1 with a 2.43 ERA (9 ER, 33.1 IP) in his last 6 starts. • 3B Patrick Kivlehan was 0x4 on Tuesday and saw his 17-game hit streak come to an end, During the streak he batted .438 (28×64) with 13 runs scored, 9 doubles, 1 triple, 2 home runs, 20 RBI, 7 walks and 1 stolen base. It was the longest streak in the Southern League this season. • His on-base streak ended at 29 games which dated back to May 22. During the streak he batted.381 (40×105) with 18 runs scored, 10 doubles, 2 triples, 4 home runs, 28 RBI, 14 walks, 3 stolen bases and a .446 OBP. the streak was first on the team moving past Jabari Blash (8/19/13-4/13/14) and trailed only John Andreoli-TNS (30, 4/6-5/11/14) in the Southern League. • D.J. Peterson, the No. 2 prospect for the Mariners, according to Baseball America was promoted to Jackson on Tuesday. He was Seattle’s 12th overall selection in the 2013 draft out of New Mexico. He also was named to the U.S. team in the 2014 Futures Game at Target Field in Minnesota. Peterson’s connecting flight was delayed in Dallas on Tuesday night and is expected to arrive in Jackson today. 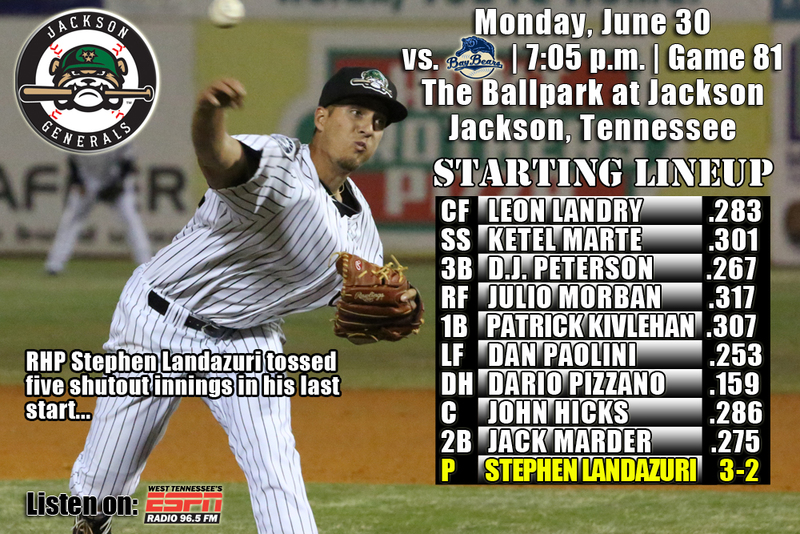 • Tonight the Generals return home to begin a 10-game homestand vs. Tennessee and Mobile. This is game one of a five-game series against the Tennessee. The Generals are 4-5 against the Smokies this including 1-3 at The Ballpark at Jackson…were 2-3 on recent road trip to Mississippi. 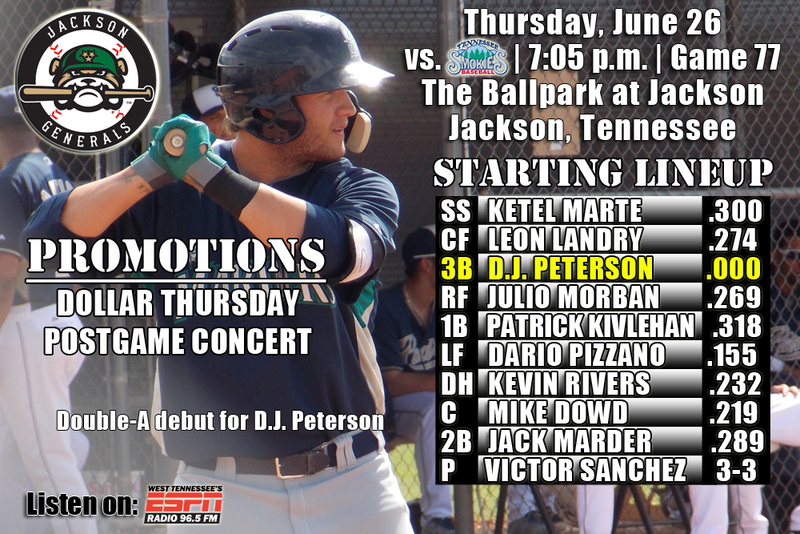 • LF Kevin Rivers and 1B Dan Paolini each drove in 2 runs, but it wasn’t enough as Jackson lost to Mississippi 7-4 on Monday night. • Paolini (2×4, 2 2B, 2 RBI), Rivers (2×4, R, 2 RBI), CF Leon Landry (2×4, 2B, BB) and RF Julio Morban (2×5, 2 R, 2B) each recorded 2 of the team’s 12 hits. 3B Patrick Kivlehan (1×4, R, BB) extended both hitting streak to 17 games and his consecutive on-base streak to 29 straight games, going 1-for-4 with 1 run scored and 1 walk. • Starter Matt Anderson (6.0,5,5,2,1,4,HR) recorded his 3rd loss with Jackson, allowing only 2 earned runs (5 R) on 5 hits in 6.0. LH Kyle Hunter (2.0,5,2,2,0,1) allowed 2 runs in the bottom of the 7th inning. • 3B Patrick Kivlehan currently has a 17-game hit streak, batting .438 (28×64) with 13 runs scored, 9 doubles, 1 triple, 2 home runs, 20 RBI, 7 walks and 1 stolen base. It is the longest streak in the Southern League this season. • After going just 4-for-35 in his first 10 Jackson games from May 10-21, Kivlehan has reached base safely in 29 straight games since May 22, batting .381 (40×105) with 18 runs scored, 10 doubles, 2 triples, 4 home runs, 28 RBI, 14 walks, 3 stolen bases and a .446 OBP. He has raised his season average from .114 to .314. Kivlehan’s 28 consecutive on-base streak is first on the team moving past Jabari Blash (8/19/13-4/13/14) and trails only John Andreoli-TNS (30, 4/6-5/11/14) in the Southern League. • D.J. Peterson, the No. 2 prospect for the Mariners, according to Baseball America and was Seattle’s 12th overall selection in the 2013 draft out of New Mexico. Peterson was batting .326 (6th) with 18 home runs, 23 doubles and 73 RBIs for A+ High Desert. • On Top of the League in June – The Generals are tied with Mobile for the best record in the league at 11-8 in June. The .304 batting average leads the league in June and is only club over .300. This is after posting the first 20-loss month since June, 2007 by going 9-20 during the month of May. • SS Ketel Marte currently has a 10-game hit streak, batting .351 (13×37) with 7 runs scored, 7 RBI, 1 walk and 2 stolen bases. It his his 5th hitting streak this season of at least 7 games (last: 13 G, 5/25-6/7). He has also hit safely in 23 of his last 24 games, batting .327 (32×98) with 16 runs scored, 5 doubles, 1 triple, 17 RBI, 2 walks and 4 stolen base. • INF Jack Marder currently has a 6-game hit streak, batting .409 (9×22) with 3 runs scored, 1 double, 1 home run and 3 RBI. Since May 24, Marder has hit safely in 19 of 22 games with 9 multi-hit efforts, batting .358 (29×81) with 15 runs scored, 4 doubles, 2 triples, 3 home runs, 12 RBI and 5 walks. 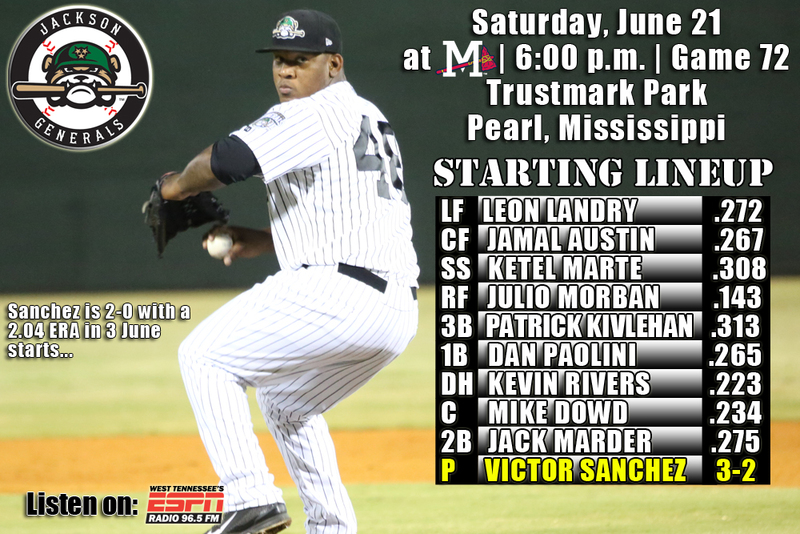 • The Generals continue the first series of the second half with game three of a five-game road series against the Mississippi Braves (1-1)…the Generals have won three straight series winning 3 of 5 in each of them…are 4-3 against the M-Braves this season. • 3B Patrick Kivlehan and PR/LF Leon Landry each drove in a run in the 9th inning as Jackson snapped a 1-1 tie to defeat Mississippi 3-1 on Friday night. • Kivlehan (2×4, R, 2B, RBI) led the team with 2 hits, extending his season-high hitting streak to 14 games. Landry (1×1, RBI, SB), SS Ketel Marte (1×4, R), DH Kevin Rivers (1×4) and 2B Jack Marder (1×3, R) each recorded 1 of the team’s 6 hits. • Starter Stephen Landazuri (4.0,3,0,0,0,3) allowed only 3 hits and struck out 3 in 4.0 scoreless innings, but did not factor into the decision. LH Cam Hobson (3.1,5,1,1,1,0) allowed a run in the 6th inning, while RH Richard Vargas (0.2,0,0,0,1,1) and RH Mayckol Guaipe (1.0,0,0,0,0,1) combined to hold the Braves scoreless over the final 1.2 innings in relief. Guaipe recorded his 5th save of the season after striking out 1 in a 1-2-3 9th inning. • OF Jamal Austin went 0-for-3 snapping his hitting streak at 15 games. During the streak he hit .393 (24×61) with 13 runs scored, 5 doubles, 2 triples, 5 RBI and 5 stolen bases. The streak was the longest streak in the Southern League this season. • 3B Patrick Kivlehan currently has a 14-game hit streak, batting .462 (24×52) with 10 runs scored, 8 doubles, 1 triple, 1 home run, 16 RBI, 5 walks and 1 stolen base. His 14-game hitting streak is currently the longest active streak in the Southern League and T2nd-longest this season in the league. • After going just 4-for-35 in his first 10 Jackson games from May 10-21, Kivlehan has reached base safely in 26 straight games since May 22, batting .387 (36×93) with 15 runs scored, 9 doubles, 2 triples, 3 home runs, 24 RBI, 12 walks, 3 stolen bases and a .449 OBP. He has raised his season average from .114 to .313. Kivlehan’s 26 consecutive on-base streak is tied for the longest on the team (also: Jabari Blash, 8/19/13-4/13/14) and trails only John Andreoli-TNS (30, 4/6-5/11/14). • On Top of the League in June – The Generals own the best record in the league at 10-6 in June. The .312 batting average leads the league in June and is only club over .300. This is after posting the first 20-loss month since June, 2007 by going 9-20 during the month of May. • SS Ketel Marte has hit safely in 19 of his last 20 games, batting .341 (28×82) with 14 runs scored, 5 doubles, 1 triple, 12 RBI, 1 walk and 4 stolen base. • INF Jack Marder has recorded 8 multi-hit efforts in his last 19 games, batting .357 (25×70) with 14 runs scored, 4 doubles, 2 triples, 3 home runs, 12 RBI and 5 walks.